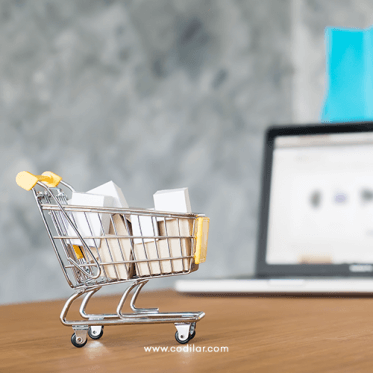 E-commerce platforms: Which is the best one? And Why? 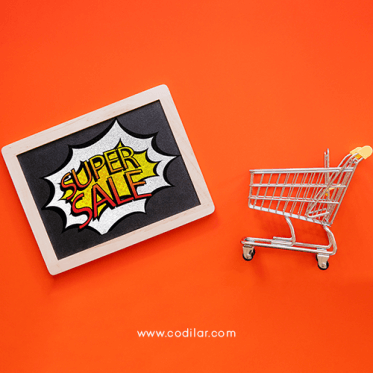 For an e-commerce business to flourish, a stunning website built on a powerful e-commerce platform with advanced features and functionalities is undoubtedly crucial. 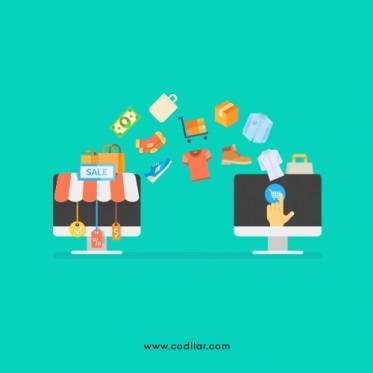 Numerous platforms out there have the capabilities to create a wonderful e-commerce website and to ultimately take your business a notch above. Selecting the right platform that has exceptionally powerful features and great efficiency to start off your business is one of the significant factors which can drive your business towards success. But having a look at the number of available platforms that are capable of building an e-commerce website can leave you baffled. Worry not, as in this article we have discussed and compared the leading platforms to build e-commerce websites – Magento, OpenCart, WooCommerce, Shopify, and BigCommerce based on the most important parameters such as price, themes, dashboard and analytics. Price is one of the major factors that most business owners think of when it comes to starting out a business, and e-commerce sector isn't an exception. The platform should be affordable and should also provide important features for the business to grow and expand. Magento – This platform is available in two versions – Magento Community (Free) and Magento Commerce (Paid). Small scale and large scale industries extensively use both the versions. Thanks to the huge developer base supporting Magento, a lot of premium features are available for free. OpenCart - It is an open source software, users can download the core software right away. But setting up the server and integrating the essential components might require technical support. WooCommerce - This is also an open source platform that supports WordPress sites. It is one of the platforms that have low scalability, thereby making it unfit for big businesses. Shopify – It does not have a free version and three plans are available. Users have to pay charges even for slight changes in their website. BigCommerce - Free trial is available up to 15 days and the user has to choose one of the four available plans. The basic plan covers some of the essential functions required for an e-commerce website, but not all. One of the missing functions is the product filtering which helps the customers to filter the products based on size, colour, and brand. The absence of this functionality can cause huge inconvenience to the customers. 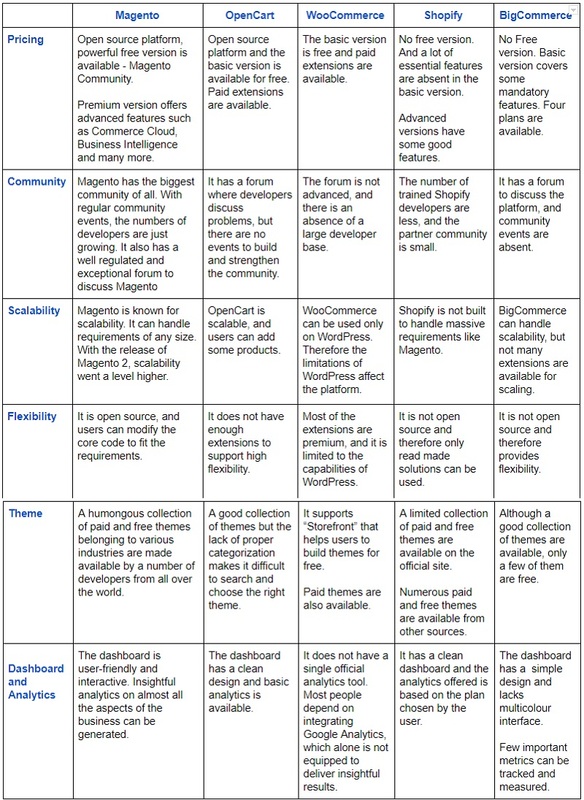 Unlike the free versions of most platforms, Magento Community is better in terms of features. As mentioned earlier, an enormous number of extensions are available for free. These themes can facilitate a wide number of functionalities which are available only in the paid versions of other platforms. Also, the premium features provide more scalability and functionality. Magento - Magento has the most robust community of all platforms used to build e-commerce. Magento Community is spread across the globe. From design to implementation, Magento enthusiasts suggest constant improvements in order to make the platform better. Magento has also partnered with a number of agencies to provide worldwide support. Various industry and community events take place regularly in several countries to strengthen the community and to enhance the platform. Users can find all sorts of solutions related to Magento in Magento Forum. OpenCart – OpenCart has a developer base and a forum to discuss the problems and solutions related to OpenCart. However, events, partnership/community programs that connect OpenCart developers and supporters are not available. WooCommerce – WooCommerce does not have a very strong developer base, and the forum is not as advanced and regulated as Magento and OpenCart. Shopify – the partner community of Shopify is small. The number of developers trained enough to handle complex tasks are comparatively less when compared to Magento. BigCommerce – BigCommerce has a small developer base and a forum to discuss the issues. But, there is a lack of strong developer base, and no BigCommerce does not conduct events and community programs. Magento leads in the list of e-commerce developing platforms with its humongous developer support from all over the world. Magento – Magento 1 was already well-known for its scalability, and with Magento 2, the scalability has reached great heights. The areas where Magento 2 excels include – processing more orders, instant responses for catalogue pages, faster add to cart and checkout response. In fact, Magento is one of the platforms that can create e-commerce sites of any size. Magento delivers maximum security for e-commerce sites. Since it has a huge developer base, almost all the security issues and bugs are fixed swiftly. Magento 2 stable version was released in 2018 which means it is free from security issues and users don't have to worry about it. OpenCart – OpenCart has good scalability, and users can list a number of products on the site. However, the last Opencart version was released in 2017 which means it can be susceptible to security issues and attacks. WooCommerce – WooCommerce works only with WordPress sites, and therefore it cannot assure great scalability. Since WooCommerce itself is more like a plugin, various factors can affect scalability. Shopify – when an e-commerce business escalates, more extensions might be required. The extension should work in accordance with the platform. Since Shopify isn't open source, there are chances that the user might not be able to use the platform to the fullest. This could be a hindrance to scalability. BigCommerce – BigCommerce can handle scalability, since it isn't open source the user is not left with more features for effectively scaling the business. Magento is one of the most preferred platforms for large-scale industries and it can cater to the huge demands of big businesses. Magento – Magento is the most flexible platform so far and based on the developer base support, it seems to remain the same in future. Users can completely modify the code to match requirements of any magnitude. Changes can be made to the base code, and it can be optimised based on the demands of the business. OpenCart – Though being an open source site, OpenCart does not offer effective extensions when compared to Magento. WooCommerce – WooCommerce has flexibility, but most of the extensions are not available for free. This platfrom operates on WordPress. Therefore, the limitations of WordPress affects WooCommerce too. Shopify – Shopify is not an open source, and therefore only ready-made solutions can be used. This platform cannot meet special requirements and conditions. BigCommerce – BigCommerce, similar to Shopify is not open source and therefore cannot provide more flexibility. Magento undoubtedly performs better than almost all the platforms when it comes to flexibility. An e-commerce platform should have the right set of tools to enable the businesses to tap into potential market areas and to analyze the current scenario. Fast-expanding businesses place the analytics at the core of their operations, for that, the platform should be able to deliver valuable insights and support more functionalities. Magento – Magneto provides a remarkable dashboard that displays critical pieces of information such as the number of orders, shopping cart conversion rate, revenue per visitor, revenue from repeat customers and other data for a particular time period. Since the results are displayed through eye-catching and easy-to-comprehend charts, it is easy to take important actions swiftly. Right from adding suppliers to sending newsletters to your customers, Magento serves as a one-stop-solution for prominent businesses and fulfils almost all the essential features. OpenCart - It has a simple dashboard with different types of information including a world map displaying the source of orders, sales analytics and so on. WooCommerce - It does not have a dedicated dashboard setup - tracking and analyzing various metrics is not possible with the free version. Numerous extensions released by various developers and most of them are premium. Shopify – Users can get information related to metrics like sales, orders and so on. Users can compare and track how the sales were performing in the past and how the sales are performing at present. BigCommerce - The dashboard of this platform has a simple design and separate tabs for different aspects of the e-commerce business such as orders, products, customers and so on are available. Users can view Conversion rate, revenue for particular time intervals. The tools and metrics offered by Magento are tailor-made and are of high standard, thereby it surpasses most other platforms. In addition to that, Magento Community is open source and has a huge base of developers supporting it. Users can always expect magnificent features and state of the art capabilities to reach the platform faster than most other platforms. Some people tend to blindly choose the platform just because it is just easy to set up and use. But what they really miss is flexibility and capability. While some platforms allow users to create a website in minutes; think for a second, can a website be created in a short span exactly fit your requirements? There is a humongous difference between a platform that has most of its functions predefined and a platform that allows you to build from scratch. Magento – Exclusively built as an e-commerce platform Magento has massive collection of free themes. Users can choose the ones that will suit the core of their business. Paid themes built on different design ideologies are available. OpenCart - Users can find themes with decent quality, if not satisfied, they can opt for paid themes. However, the user might face difficulty in selecting the right theme for their business. This is because the themes are not categorized based on the nature of the industry. WooCommerce - It offers both free and paid themes. Users also have the option to use Storefront Extensions which are nothing but the tools that can be used to customize the website. Shopify – Shopify has a good number of themes categorized based on the industry types. But, the number of themes available on the official website are considerably less. BigCommerce - Although the platform has a considerable number of themes, a very few of them are available for free. The prices of premium themes are on the higher side when compared to other platforms, so it might not be suitable for most businesses. For small-scale businesses, OpenCart and Magento Community can be good choices. For large scale businesses, preferred options are Magento Commerce and Shopify, the former has better and more options. Finally, the best of all. If we take a deeper look, Magento and Shopify seem to outperform the other three platforms. But, only one of these two can be selected and this is where the competition gets intense. Magento has a huge developer support base and this can ensure the arrival of more remarkable features now and in the future. Furthermore, Magento has a well-maintained forum where you can get instant remedies, in case, if you face any issues or have any queries. If you are still inconclusive, have a peek at what the leading businesses are using. Samsung, Nike, Ford, Nestle Nespresso, Lenovo, and many such conglomerates have built their websites on Magento and that has been a great boost to their business. Magento performs way better than most of the platforms in almost all the crucial aspects of the e-commerce business. Equipped with future-ready attributes, you don't have to think twice about choosing Magento to build your e-commerce website.